I was very excited to be able to use this app to get practice test results, and everything scanned fine until the end, when it told me the scanning was unsuccessful even though it was. I don’t really understand what is happening, I even tried manually entering my scores and it said the exact same thing. So, I don’t know how I did or how I need to improve. It also could have something to do with the test number. 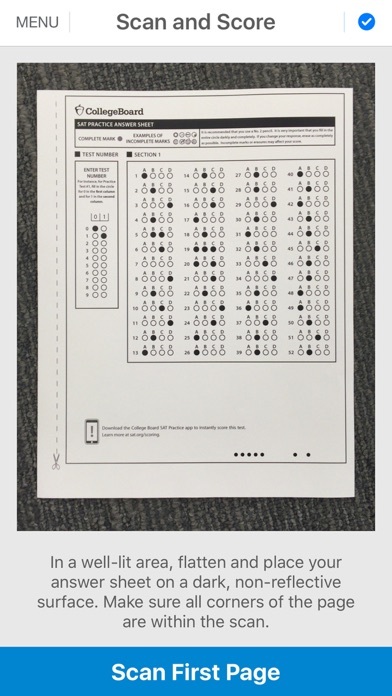 There were two options for a practice test, and I had #2. I had seen from previous comments that practice test #2 did not work and only the 1st one did. This is really getting on my nerves and was a waste of my time. Modal window says ‘scan failed’ whether you you actually scan, or do manual entry. Waste of time! It doesn't work for iPhone X and above. I used this app before I took the PSAT in 2018, and I was able to sign in and scan my practice exam I had taken. However, I can’t scan anything or look back at my previous scan stats now because I can’t sign in. Clicking the sign in button will lead me to a webpage to sign in, but it just becomes a blank gray webpage after I put in my correct login information. I have tried to sign in on my XR, an 8, and an iPad 4. I’d really like to be able to log in and scan my practice test I just took before I take my SAT in a week. It’s possible I can’t login in because there’s too many people using it before the next SAT test day. Anyways, please try to find out why I can’t sign in and fix it please. Update: Every now works. I can sign in and scan my answers now. 👍🏼 There are issues with the formatting/interface though. On my iPhone XR, certain buttons are hard to push and some things don’t fit onto the screen. Please fix this. 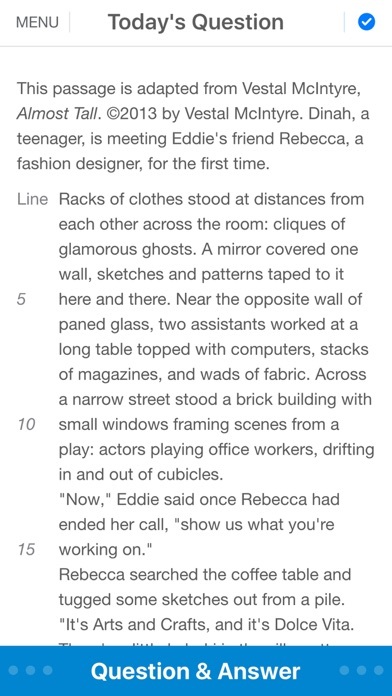 I’ve never written a review in my life, but I have also never experienced an app so not usable. I just want to use the scan function because I purchased the SAT study guide booklet, but every time I try to sign in the app brings me to a white screen. No one has a fix for this, and I’ve reached out by phone and email to the college board and they have no words for this and they keep wasting my time with solutions that don’t work and it’s very annoying and unfair considering I paid for this book. won’t even let me sign in to scan my test which is the whole point of the app. the screen just goes white after clicking sign in. this is really inconvenient considering my test is in a week. please fix! Every time I try to sign in to score my practice test, the app just turns white and doesn’t work. It happens on all IPhones, my friends Samsung worked perfectly fine when trying to sign in. I am not able to sign in to the app. I am trying to score my practice test but once I press sign in the screen goes blank and stops working. Please fix! This app worked for the first two tests that I took as practice but then all of a sudden I can’t log onto my account and I can’t see my past scores. The app is useless. Literally spent a whole 4 hours working on the practice SAT and was looking forward to seeing what I got. When I tried to open the scan and score section, I signed in correctly but I just took me to a white page. The white page says “back to app” and once I click that it just restarts the entire process. This is so stupid. No. Satisfaction. At. All. For some reason the app just sends you to a blank screen after rerouting you to the collegeboard website. This is a major problem because the app is completely useless if you cannot sign in. Very disappointed with the way this was developed. 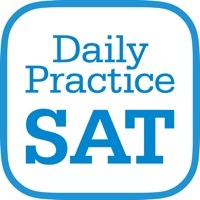 This app is great for scanning SAT practice scores and getting a daily practice question. That’s it. However, this app is now useless because there’s no way to log into one’s CollegeBoard account—it just goes to a blank white page. This has been a problem for days now and needs to be fixed. Otherwise, make it so that the app doesn’t require syncing with a CB account in order to scan scores. Scan and Score function doesn’t work. Once you click on Scan and Score and then click Log-in, the screen goes completely white. I was in an SAT prep class and my teacher highly reccomended this but I can’t even use it because I try to log into my College Board account and then my screen is just white. I am not the only person having this problem. Idk if it’s because I have and iPhone X. Please update this soon because hand grading practice tests are a pain in the bum. App is almost impossible to use without signing in( can’t sign in ) app is useless! The app won’t let me do anything till I long into my college board account, but it won’t let me log in. Collegeboard makes an app and forces us to download for their profit. The app doesn’t even work. You can’t sign in. They took our money and ran. I have tried all day to scan my paper scores and it tells me I am not signed in and does not let me scan my practice SAT. Very frustrating! I just spent 4 hours taking a practice test when going to grade it I realized I have to download this app. I do and it won’t let me sign into my college board account it just keeps on freezing on a white blank screen. The app acts in a slow manner and crashes with regularity. I cannot tell much about the app, because it won’t allow us to sign in. I just get a blank white screen after entering my login and password. So if the official app doesn’t work, how can we trust the company to run standardized tests for all kids in the country? I wonder if anything else is broken in the scoring system itself. Very frustrating! This app is great, but every time I sign in, the screen goes blank and it doesn’t process that I’m signed in. The log in function is not working therefore you cannot scan and score and keep track of your progress. The worst part is that’s there is no other app that can do this and the College Board and SAT are an education monopoly. This app ALWAYS has issues. 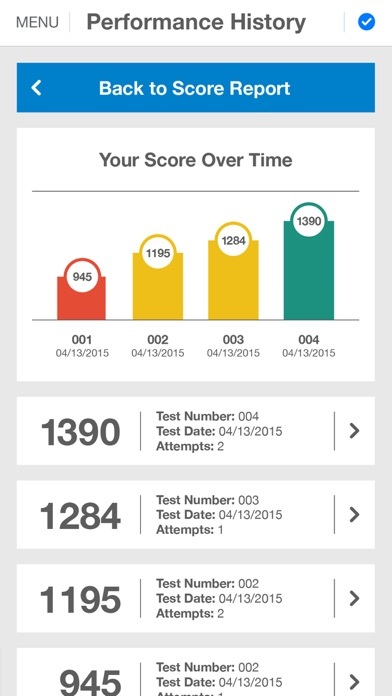 We have our whole junior class a practice test with the hopes of grading it using this app. Because it won’t work, I’m spending my weekend hand grading tests. Customer support was not helpful. All they said I can do is hand grade. Thanks for nothing. I really want to spend me whole weekend hand grading tests. Just to get your scores you study day and night, just to get a spot in the competitive world, then you are met by a white screen. You think it'll work by tomorrow and yet again met by a white screen who wouldn't even think of waving back. Now, your future is at stake because of an application that refuses to work. App won’t let user sign in so can’t use scan and score feature. I sign in, then the screen just goes white and at the bottom says “go back to app”. When you click on that it says you still need to sign in. Viscous cycle. Nothing seems to work and can’t seem to find anyone at college board who can help. Have logged in to their website and account credentials work so not sure why it doesn’t work with app. I have tried to enter my college board account repeatedly with no success. It lets me put in my information and press enter, then the screen turns white and the only option is to go back. Very frustrating. So here’s the thing: The app does work. The questions work and the scan function does too. However, my problem lies with actually signing into the app. I have been signed into the app since I downloaded but for some reason it has recently logged me out randomly and I have been unable to log back in. I have tried numerous times but it never seems to work. Please fix this bug. Today I spent about 4 hours of my day doing an SAT Practice Test. After this, I was hoping to achieve my scores and see whether I improved from before (I used this app before without any problems) or not. When I re-downloaded it (a couple of days ago), I used it for the daily questions and it was working fine. But today, when I tried to log in to check my scores, it just went to a white page, regardless of my correct input of my account name and password. I have now spent about an hour trying to make it work: downloading, re-downloading, downloading it on other family members’ phones, and it just does the same thing over and over again. This app needs a few updates at the least. There isn’t even any other solution to checking my scores except manually, which would take even more time and stress out of my day. I have been unable to score my practice test because after I sign in, the screen goes white. This app has malfunctioned on both my Mom’s iPad and my phone.